The prevalence of tick-borne diseases is increasing worldwide. One such emerging disease is human anaplasmosis. The causative organism, Anaplasma phagocytophilum, is known to infect multiple animal species and cause human fatalities in the U.S., Europe and Asia. Although long known to infect ruminants, it is unclear why there are increasing numbers of human infections. We analyzed the genome sequences of strains infecting humans, animals and ticks from diverse geographic locations. Despite extensive variability amongst these strains, those infecting humans had conserved genome structure including the pfam01617 superfamily that encodes the major, neutralization-sensitive, surface antigen. These data provide potential targets to identify human-infective strains and have significance for understanding the selective pressures that lead to emergence of disease in new species. Collected for University of Florida's Institutional Repository by the UFIR Self-Submittal tool. Submitted by Anthony Barbet. Pathogens 2013 2 546 and Minnesota, a rodent and dog origin strain from Minnesota, two Ap variant 1 strains from Minnesota, a horse origin strain from California and two sheep origin strains from Norway for which no in vitro cultures are available. In Figure 1 the complete genome sequence of a strain derived from rodents in an area of high prevalence for human disease (Camp Ripley, MN, USA ) is compared with that of the human ApHZ strain (from the state of New York). The figure shows Blast comparisons of the rodent and human strains, particularly the positions of members of the pfam01617 superfamily, to which msp2/p44 belongs. Overall, despite widely separated geographic and species origins, the two genomes are conserved and almost completely syntenic. The majority of the highly repetitive msp2/p44 genes (visualized using partial opacity) are located in the third of the genome closest to the origin of replication (top of figure, changing sign of GC s kew), as rep orted previously [13 ] However, using high stringency Blast comparisons (fifth circle from the outside) differences between the two genomes were primarily localized to this region also and to msp2/p44 genes in particular, showing the propensity of this gen e family to undergo rapid diversification. F igure 1. Genome synteny between two strains of A. phagocytophilum Ap HZ (human origin, NY, USA ) an d ApJM (rodent origin, MN, USA ). The reference strain is ApHZ (GenBank CP000235). The two outermost circles show annotated ApHZ coding sequences, the third circle shows the locations of members of the ApHZ pfam01617 superfamily, the fourth and fifth circles are Blastn comparisons of the ApJM genome with ApHZ using 90% and 99% identity cutoffs respectively, the sixth circle shows GC skew and the innermost circle the numeric genome position. Comparisons were conducted using the CGView server using partial opacity to visualize overlapping hits (darker bars in the green and blue circles) The white bars on the fifth circl e indicate no match. Pathogens 2013 2 547 This comparative genomics analysis was extended to all nine strains (Figure 2) Except for Ap variant 1 strains, the U.S. strains had high identities across their entire genomes, with the ApDog strain most similar to human ApHZ by Bl ast analysis The Norwegian sheep and U.S. Ap variant 1 strains had the lowest identities with ApHZ in Blast comparisons, especially in members of the pfam01617 superfamily. Figure 2 Similarities and differences between nine A. phagocytophilum genomes. Roche/454 reads from each genomic DNA were compared with the human ApHZ genome as reference using Blastn and the CGView Comparison Tool. The first to ninth circles compare, respectively, sequencing reads from ApHZ, ApDog, ApJM, ApHGE1, ApMRK, ApC RT35, ApCRT38 1, ApNorV2, ApNorV1 genomic DNAs. The 10th circle shows the locations of members of the ApHZ pfam01617 superfamily. Blast parameters used a query size of 500 bp segments of the reference genome and a Blast expect value of 10 100 Circles are colored according to the percent identities of matches (black to light red, 100 % 90% identical, dark to light blue, 88 % 82% identical, colorless, 0% identical). T he differences in this superfamily were examined more closely in order to determine their ms p2/p44 genomic repertoires and if differences were primarily located in the known pseudoge ne hypervariable region s (Figure 3 ). Pathogens 2013 2 551 hudsonius ), Camp Ripley, Minnesota; ApDog, Minnesota; ApCRT35, Camp Ripley tick ( Ixodes scapularis ), Minnesota (defined previously as Ap variant 1); ApCRT38 1, Camp Ripley tick ( I. scapul aris ), Minnesota (Ap variant 1); ApMRK, horse, California; ApNorV1, sheep, Norway; ApNorV2, sheep, Norway. A. phagocytophilum genomic DNA was prepared from in vitro cultured organisms or directly from infected sheep (Norwegian str ai ns), as described previo usly [17 ] 3.2. Ethics Statement The experimental study in sheep was approved by the Norwegian Animal Research Authority. 3.3 Genome Sequencing and Bioinformatics Genomic DNA was sequenced on the Roche/454 Genome Sequencer using non paired and 3 kb paired en d libraries, also as described [17 ] Mean genome coverage with respect to ApHZ varied between 31.3X and 72.1X. The ApJM sequence was finished using manual inspection for conflicts and mismatched paired ends and PCR to fill gaps. All sequences were compa red with ApHZ for regions of identity u sing Blastn analysis in CGView [18 19 ] Differences in the msp2/p44 repertoires between strains were defined using a method previously validated using the pfam01617 superfamily and two completely Sanger sequenced geno mes of Anaplasma marginale [20 ] Briefly, this method uses Mosaik to align individual reads and generate BAM format files to detect gaps in alignment (no coverage) with respect to the annotated reference sequence. In A. marginale this method detected all different pseudogenes having <90% nucleotide identity with the reference genome. In homologous comparisons between ApHZ Roche/454 reads and the ApHZ genome all msp2/p44 pseudogenes were detected as present (Table 1). Comparisons of average nucleotide ident ities and the correlation coefficients of tetranucleotide signature frequencies between genomes were conducted using Jsp ecies software, as described [15 ]. 3.4 Analysis of msp2/p44 R epertoires To analyze global msp2/p44 repertoires, deposited msp2/p44 sequences were downloaded from GenBank following Blast searches; several large datasets are also av ailabl e from published studies [16 21 25 ] The sequences were each trimmed to that encoding the hypervariable region, where possible using the consensus fl anking LAKT residues, and the polypeptides were aligned ( all against all) with MATGAT [26 ] This generates the alignments that can be inspected for accuracy, and allows export of all percent identity values to a spreadsheet. This spreadsheet was analyzed i n Excel for the relatedness of the different datasets. The percent identity of each variant msp2/p44 sequence with every ApHZ msp2/p44 polypeptide encoded by a pseudogene was reported and, from that, the mean best match with ApHZ (maximum percent identity) determined for each dataset. As the percentage identities were not normally distributed and the population variances were unequal, significant differences between groups were determined by n onparametric methods (Table 2). Pathogens 2013 2 553 References 1. Patz, J.A. ; Olson, S.H. ; Uejio, C.K. ; Gibbs, H.K. 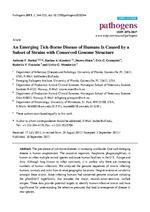 Disease emergence f rom global climate and land use change. Med. Clin. North Am. 2008 92 147 3 1 491 2. Dumler, J.S. ; Choi, K.S. ; Garcia Garcia, J.C.; Barat, N.S. ; Sco rpio, D.G. ; Garyu, J.W. ; Grab, D.J. ; Bakken, J.S. Human granulocytic anaplasmosis and Anaplasma phagocytophilum Emerg. Infect. Dis. 2005 11 182 8 1 834 3. CDC. Statistics and Epidemiology Annual Cases of Anaplasmosis in the United States ; Available online: www.cdc.gov/anaplasmosis/stats/ (accessed on 5 September 2013 ). 4. Dahlgren, F.S. ; Mandel, E.J. ; Krebs, J.W. ; Mas sung, R.F. ; McQuiston, J.H. Increasing incidence of Ehrlichia chaffeensis and Anaplasma phagocytophilum in the United States, 200 0 2 007. Am. J. Trop. Med. Hyg. 2011 85 12 4 1 31 5. Zhang, L.; Wang, G.; Liu, Q.; Chen, C.; Li, J.; Long, B.; Yu, H.; Zhang, Z.; He, J.; Qu, Z.; et al. Molecular analysis of Anaplasma phagocytophilum isolated from patients with febrile diseases of unknown etiology in China. PLoS O ne 2013 8 e57155 6. Annen, K.; Friedma n, K.; Eshoa, C.; Horowitz, M.; Gottschall, J.; Straus, T. Two cases of transfusion transmitted Anaplasma phagocytophilum Am. J. Clin. Pathol. 2012 137 56 2 5 65 7. Jereb, M.; Pecaver, B.; Tomazic, J.; Muzlovic, I.; Avsic Zupanc, T.; Premru Srsen, T.; Levicnik Stezinar, S.; Karner, P.; Strle, F. Severe human granulocytic anaplasmosis transmitted by blood transfusion. Emerg. Infect. Dis. 2012 18 135 4 1 357 8. Massung, R.F. ; Priestley, R.A.; Miller, N.J.; Mather, T.N. ; Levin, M.L. Inability of a variant st rain of Anaplasma phagocytophilum to infect mice. J. Infect. Dis. 2003 188 175 7 1 763 9. Massung, R.F. ; Mather, T.N. ; Levin, M.L. Reservoir competency of goats for the Ap variant 1 strain of Anaplasma phagocytophilum Infect. Immun. 2006 74 137 3 1 375 10. Dunning Hotopp, J.C.; Lin, M.; Madupu, R.; Crabtree, J.; Angiuoli S.V. ; Eisen, J.A. ; Seshadri, R. ; Ren, Q.; Wu, M.; Utterback, T.R. ; et al Comparative genomics of emerging human ehrlichiosis agents. PLoS Genet. 2006 2 e21 11. Barbet, A.F. ; Meeus, P.F. ; B langer, M.; Bowie, M.V. ; Yi, J.; Lundgren, A.M.; Alleman, A.R. ; Wong, S.J. ; Chu, F.K. ; Munderloh, U.G. ; et al. Expression of multiple outer membrane protein sequence variants from a single genomic locus of Anaplasma phagocytophilum Infect. Immun. 2003 71 170 6 1 718 12. Lin, Q.; Rikihisa, Y. Establishment of cloned Anaplasma phagocytophilum and analysis of p44 gene conversion within an infected horse and infected SCID mice. Infect. Immun. 2005 73 510 6 5 114 13. Foley, J.E. ; Nieto, N.C.; Barbet, A.F. ; Foley, P. Antigen diversity in the parasitic bacterium Anaplasma phagocytophilum arises from selectively represented, spatially clustered functional pseudogenes. PLoS O ne 2009 4 e8265 14. Stuen, S. Anaplasma phagocytophilum The most widespread tick borne infection in animals in Europe. Vet. Res. Commun. 2007 31 7 9 8 4 15. Richter, M.; Rossell Mra, R. Shifting the genomic gold standard for the prokaryotic species defin ition. Proc. Natl. Acad. Sci. USA 2009 106 1912 6 1 9131. Pathogens 2013 2 554 16. Barbe t, A.F. ; Lundgren, A.M.; Alleman, A.R. ; Stuen, S.; Bjersdorff, A.; Brown, R.N. ; Drazenovich, N.L. ; Foley, J.E. Structure of the expression site reveals global diversity in MSP2 (P44) variants in Anaplasma phagocytophilum Infect. Immun. 2006 74 642 9 6 43 7 17. Al Khedery, B.; Lundgren, A.M.; Stuen, S.; Granquist, E.G. ; Munderloh, U.G. ; Nelson, C.M. ; Alleman, A.R. ; Mahan, S.M. ; Barbet, A.F. Structure of the type IV secretion system in different strains of Anaplasma phagocytophilum BMC Genomics 2012 13 e 678 18. Grant, J.R.; Stothard, P. The CGView Server: A comparative genomics tool for circular genomes. Nucleic Acids Res. 2008 36 W18 1 W 1 84 19. Grant, J.R.; Stothard, P. Comparing thousands of circular genomes using the CGView Comparison Tool. BMC Genomics 2012 1 3 e 202 20. Dark, M.J.; Al Khedery, B.; Barbet, A.F. Multistrain genome analysis identifies candidate vaccine antigens of Anaplasma marginale Vaccine 2011 29 492 3 4 932 21. Casey, A.N. J. ; Birtles, R.J.; Radford, A.D.; Bown, K.J. ; French, N.P. ; Woldehiwet, Z.; Ogden, N.H. Groupings of highly similar major surface protein (p44) encoding paralogues: A potential index of genetic diversity amongst isolates of Anaplasma phagocytophilum Microbiology 2004 150 72 7 7 34 22. Gaowa; Wuritu; Wu, D.; Yoshikawa, Y.; Ohashi, N .; Kawamori, F.; Sugiyama, K.; Ohtake, M.; Ohashi, M.; Yamamoto, S.; et al. Detection and characterization of p44/msp2 transcript variants of Anaplasma phagocytophilum from naturally infected ticks and wild deer in Japan. Jpn. J. Infect. Dis. 2012 65 7 9 8 3 23. Wuritu; Gaowa ; Kawamori, F.; Aochi, M.; Masuda, T.; Ohashi, N. Characterization of p44/msp2 multigene family of Anaplasma phagocytophilum from two different tick species, Ixodes persulcatus and Ixodes ovatus in Japan. Jpn. J. Infect. Dis. 2009 62 14 2 1 45 24. Ohashi, N.; Gaowa ; Wuritu ; Kawamori, F.; Wu, D.; Yoshikawa Y.; Chiya, S.; Fukunaga, K.; Funato, T.; Shiojiri, M.; et al. Human granulocytic a naplasmosis, Japan. Emerg. Infect. Dis. 2013 19 28 9 2 92 25. Caspersen, K.; Park, J.H. ; Patil, S.; Dumler, J. S. Genetic variability and stability of Anaplasma phagocytophila msp2 (p44). Infect. Immun. 2002 70 123 0 1 234 26. Campanella, J.J.; Bitincka, L.; Smalley, J. MatGAT: An application that generates similarity/identity matrices using protein or DNA sequences. BMC Bioinformatics 2003 4 e 29 27. Bowman, D.; Little, S.E. ; Lorentzen, L.; Shields, J.; Sullivan, M.P. ; Carlin, E.P. Prevalence and geographic distribution of Dirofilaria immitis Borrelia burgdorferi Ehrlichia canis and Anaplasma phagocytophilum in dogs in the United States: Results of a national clinic based serologic survey. Vet. Parasitol. 2009 160 13 8 1 48. 28. Kim, H.Y. ; Rikihisa, Y. Characterization of monoclonal antibodies to the 44 kilodalton major outer membrane protein of the human granulocytic ehrlichiosis agent. J. Clin. Microbiol. 1998 36 327 8 3 284. 29. Wang, X.; Kikuchi, T.; Rikihisa, Y. Two monoclonal an tibodies with defined epitopes of P44 major surface proteins neutralize Anaplasma phagocytophilum by distinct mechanisms. Infect. Immun. 2006 74, 187 3 1 882. Pathogens 2013 2 555 30. Foley, J.E. ; Nieto, N.C.; Massung, R.; Barbet, A.; Madigan, J.; Brown, R.N. Distinct ecologicall y relevant strains of Anaplasma phagocytophilum Emerg. Infect. Dis. 2009 15 84 2 8 43. 31. The NCBI Bioproject Portal. Available online: www.ncbi.nlm.nih.gov/bioproject (accessed on 5 September 2013 ). 20 1 3 by the authors; licensee MDPI Basel, S witzerland. This article is an o pen a ccess article distributed under the terms and conditions of the Creative Commons Attribution license (http://creativecommons.org/licenses/by/3.0/).